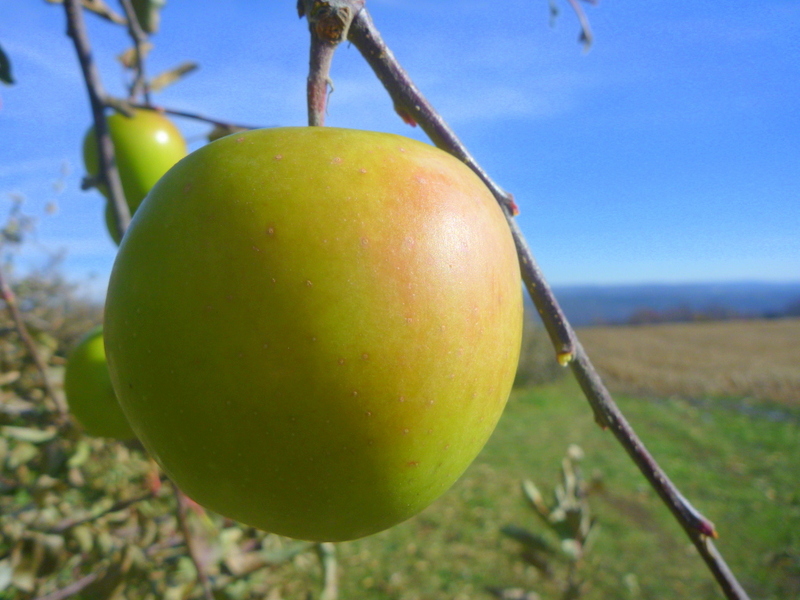 ← We’re Still Open for Apple Picking, Donuts, Pears, Sprouts, and Cider! DIAMONDS ARE FOREVER, but apples are for NOW. Just ask Katrina. She couldn’t care less about your precious stones, but hold out an apple, and you have her undivided attention. 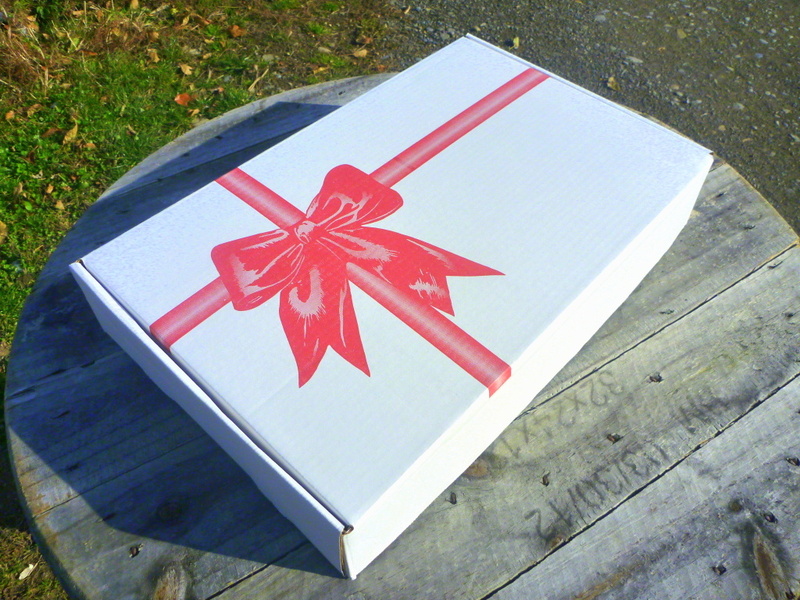 So, something new for you and yours: A Local Apple Gift Box! The latest in our line of Hillbilly Holiday™ products. 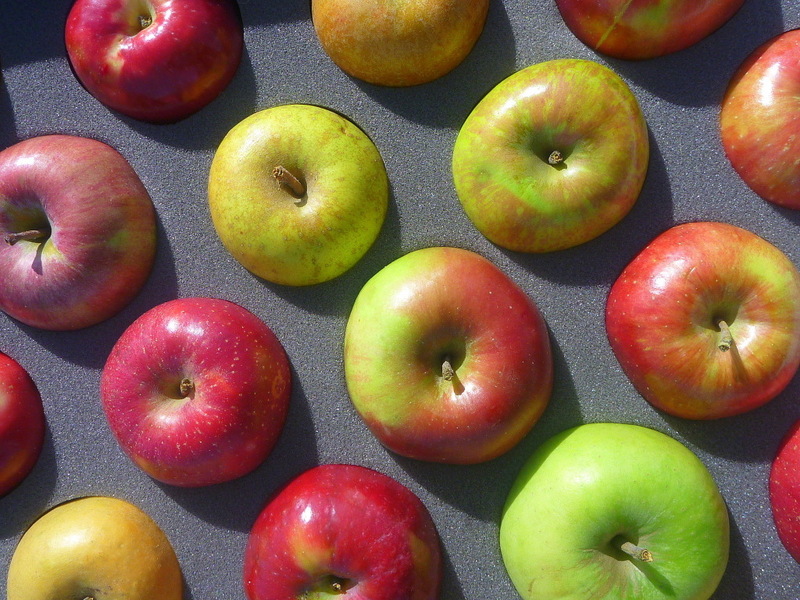 You get 18 beautiful apples from Indian Creek, including exotics and heirlooms that you won’t find in stores. 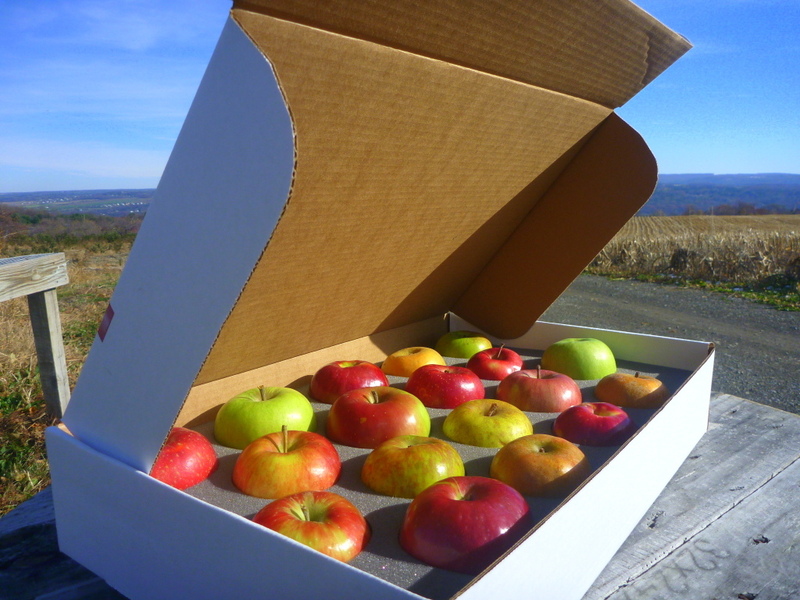 For just $38, you get all those apples packed safely for shipping… or a long drive to Thanksgiving dinner. 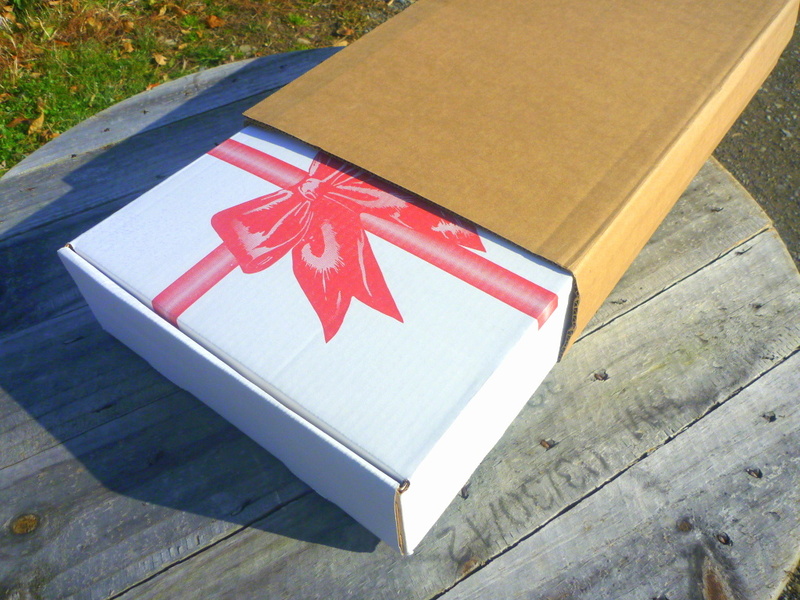 The 11/20 pickup will leave you time to ship your Gift Box to loved ones by Thanksgiving. The 11/26 pickup will be great for local gifts and roadtripping to Thanksgiving. You can pay with cash or local check when you pick up the Gift Boxes. 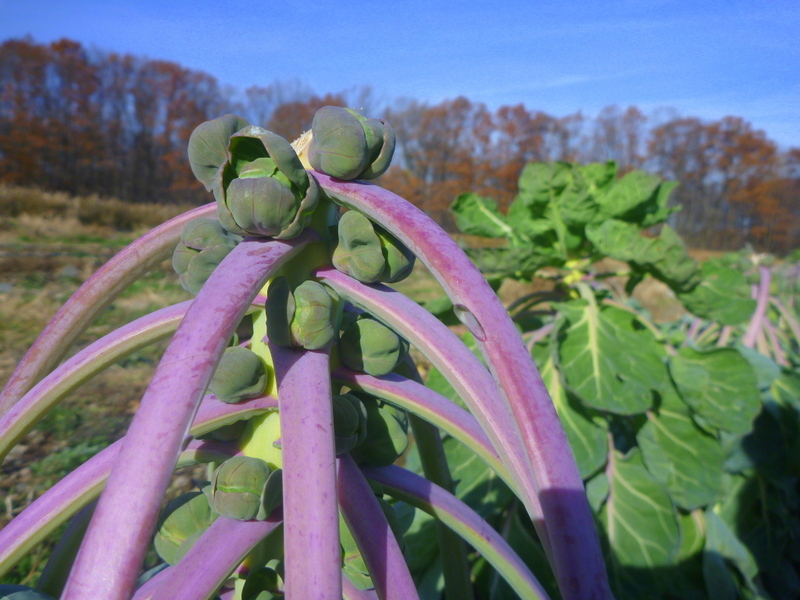 Call the farm stand with questions at (607) 227-8248. Inside, there will be a printed guide to the apples. A special shipping sleeve will protect the box. Share some ‘Creekage! Winter weather encroaches and the leaves have mostly blown off the branches. But the mutsus are STILL PICKING! It is easy to see apples on bare trees. You will find that some have softened, but they are still juicy and perfect for many uses. Sprouts are cute this time of year. Their giant leaves are droopy, and the lovely food revealed. We’ll have them at the stand. 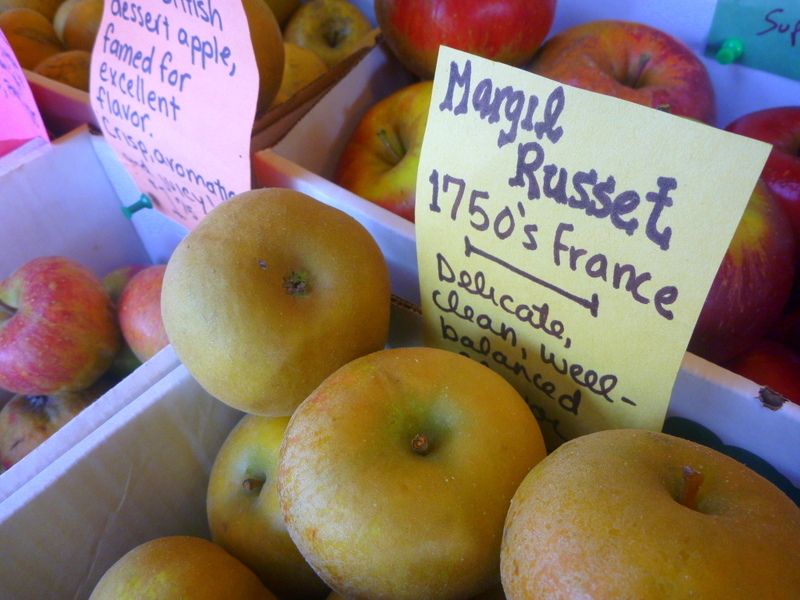 Tons—literally—of apples at the stand. We have apples for eating, cooking, canning, saucing, freezing, and baking. And, as always, apple cider! 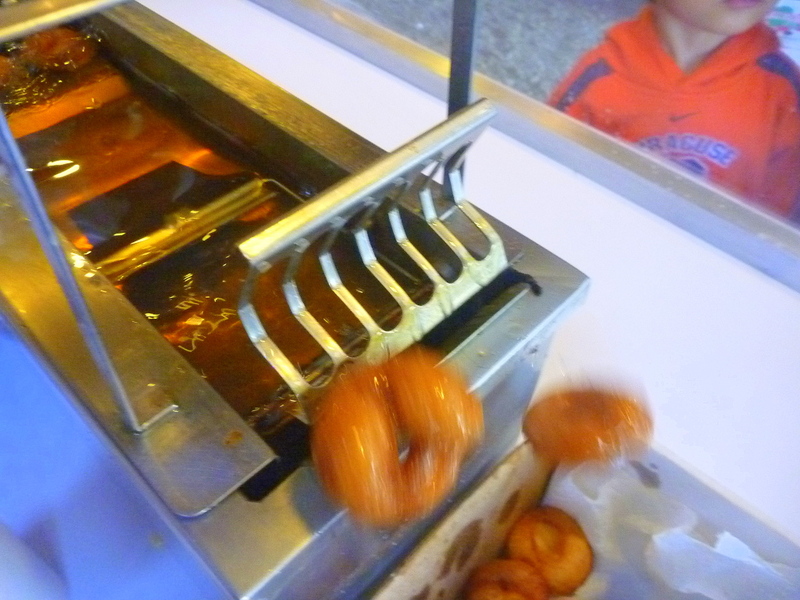 Some of which has been turned into donuts. They’ll be fresh from 11 AM – 4PM, Sat and Sun. 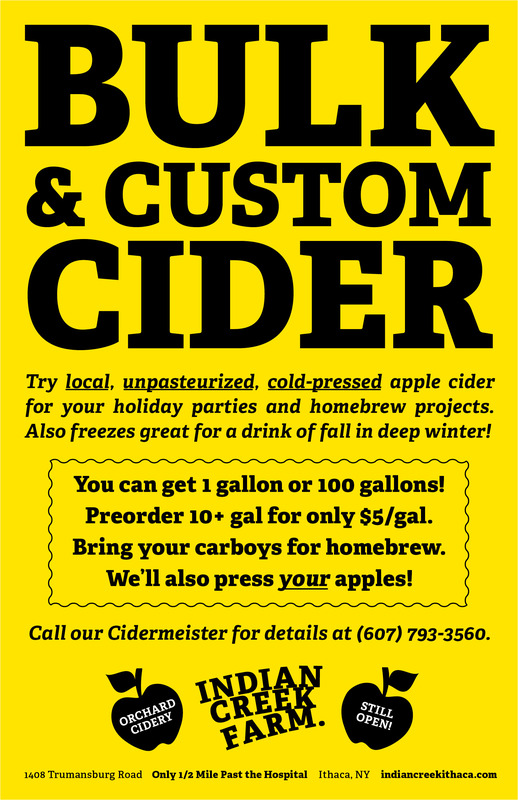 ‘Tis peak season for our Bulk & Custom Cider service. 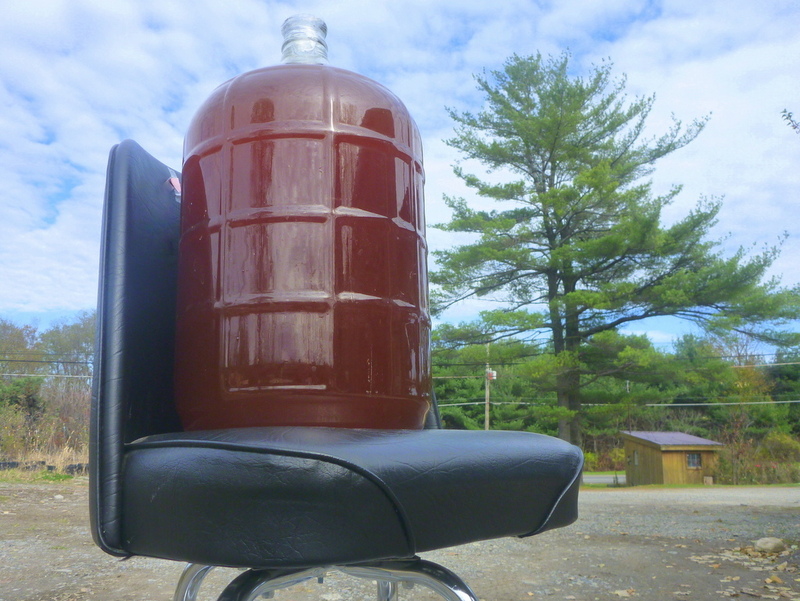 We are filling carboys and pressing regularly. See the poster. Meanwhile, our days have shifted to nursery mode. 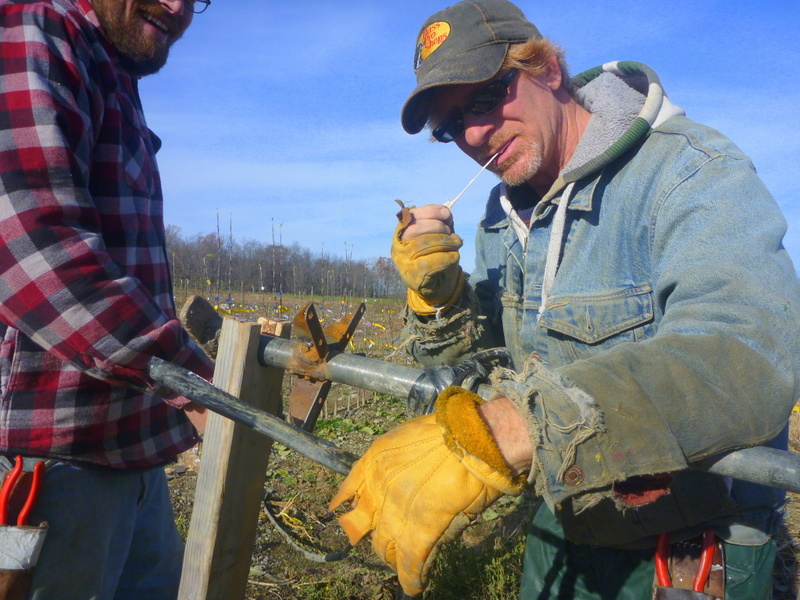 We’re tending to the baby trees, and using bubble gum to fix old machines. Thanks to our neighbors at Gimme! 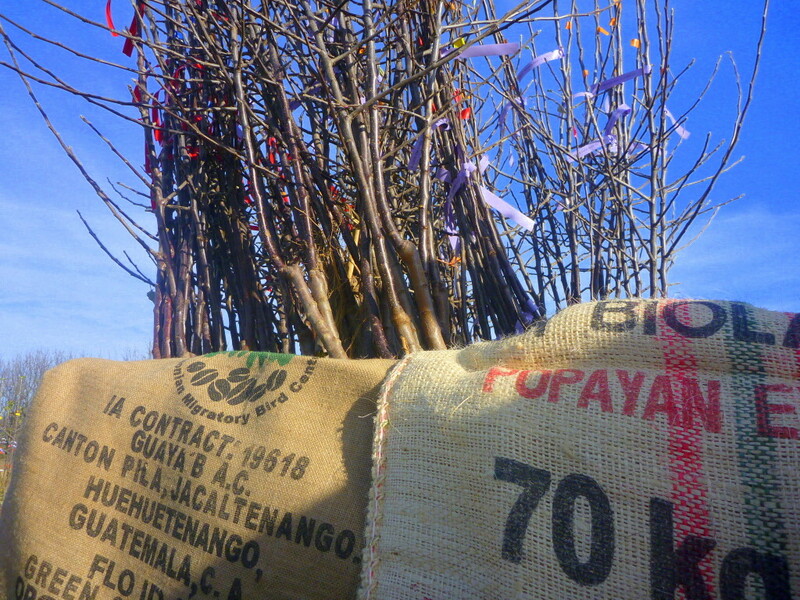 Coffee up the street, we’re packing the saplings in repurposed coffee sacks. 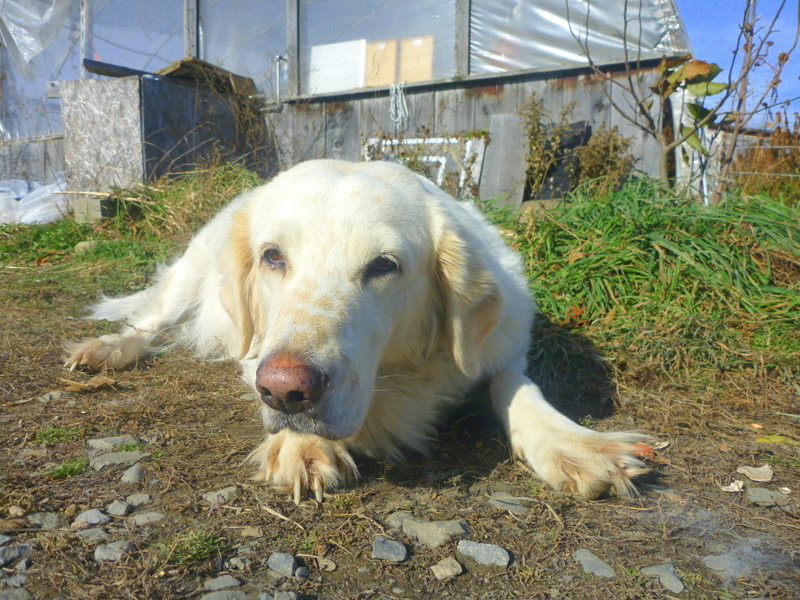 Tundra just said, “Meow.” Weird. Hope to see you at The ‘Creek. 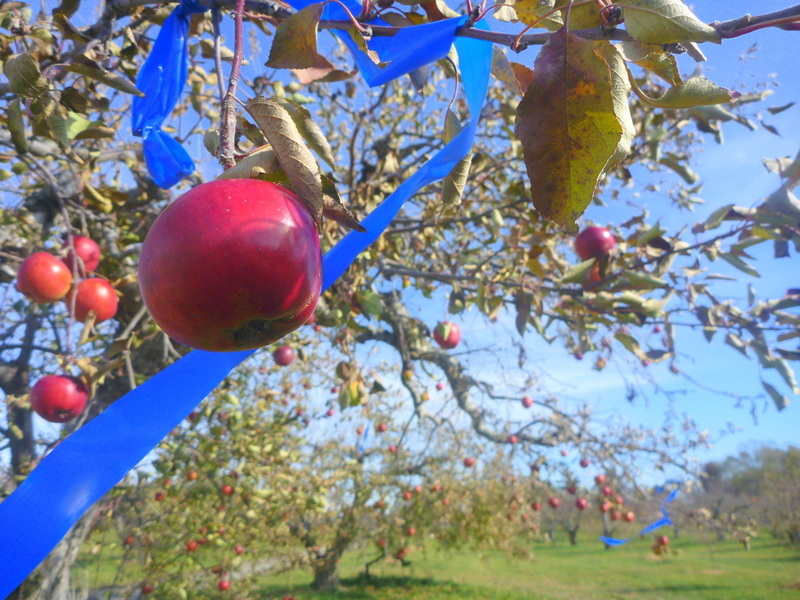 This entry was posted in Crop Alerts & Farm Buzz and tagged apples, country life, crops, Farm Life, Food Art, Food Photography, Food Writing, Fruits and Vegetables, Local Food, Photos, small farm, u-pick. Bookmark the permalink. 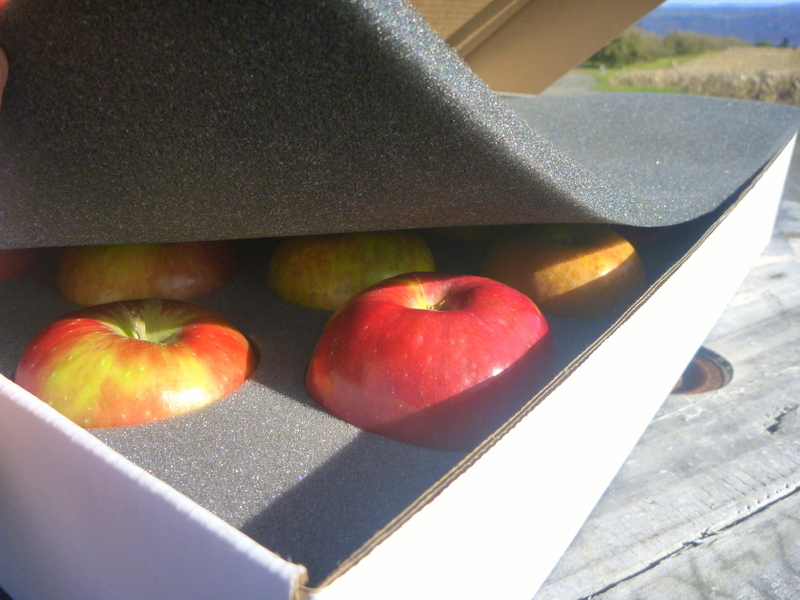 1 Response to New Local Apple Gift Boxes! And a Warm Farm Weekend. That is a wonderful box they are using. The apples are well arrange and are perfect for gift ideas. I haven’t tried picking apples yet, but I’d really love try it someday. Thanks for sharing this! 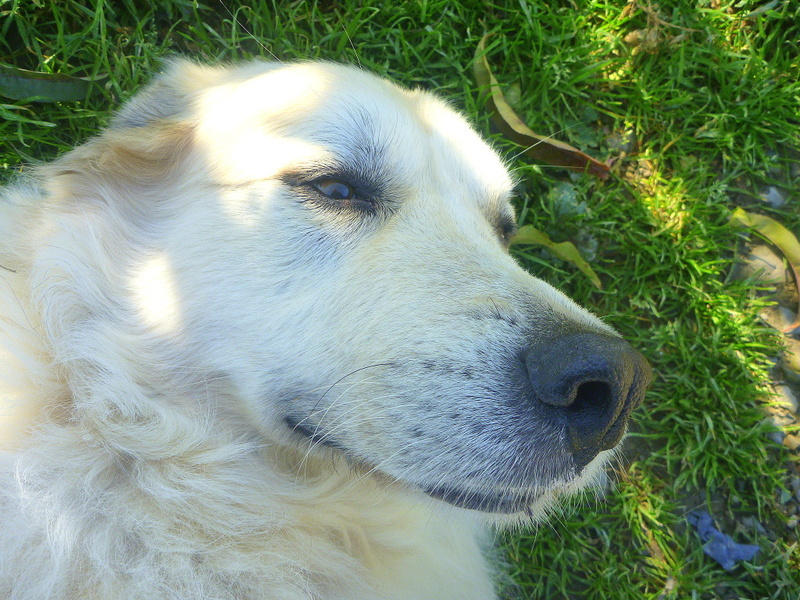 And by the way, Tundra looks like she or he is having so much fun.